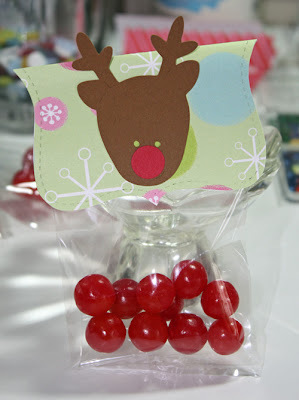 I used a mini cello bag and filled it with ten sour cherry round-shaped candies I found at Hobby Lobby. 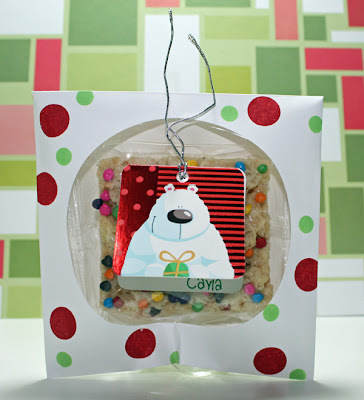 I then topped it using some patterned Christmas paper cut with the Top Note Stampin' Up die. I also used my Cricut Doodlecharms cartridge to cut a 2 1/2 inch reindeer for the front. 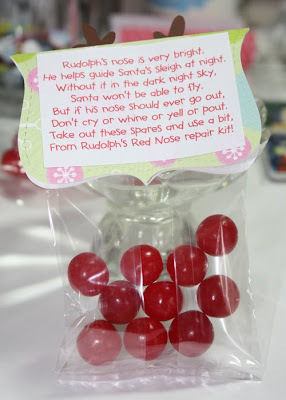 On the reverse side I attached the "Repair Kit" poem which tells the children what to do with their spare noses. I thought this idea was really cute and may be something new they hadn't seen before. 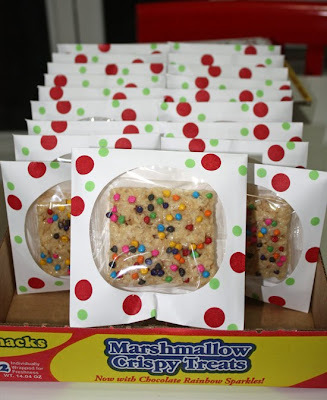 Next up, for my 4th grade class, I used plain white computer CD envys stamped with a polka dot design in red and green, to hold individually wrapped krispie treats. To stamp the polka dots I used PTI's Polka Dot Basics and Stampin' Up ink in Real Red and Green Galore. To save on time, I decided to top each envelope using an assortment of tags I found at Michael's. They were attached to the front using a glue dot. Easy, easy. Here's the boxful before the tags were attached to the front. This class is large, 21 + the teacher. My girls love having something to pass out and I have fun putting these sweet treats together! I'm off to "work" on something else. Have a good day!